Today is a BIG day! Not only is it a national holiday, but it's also PIMP'S BIRTHDAY! Yay! My little man is 12 years old today. To celebrate, we did we what always do on holidays around here... we got a little silly and had a party! It's my birthday, you guys! You can't blow out these candles. 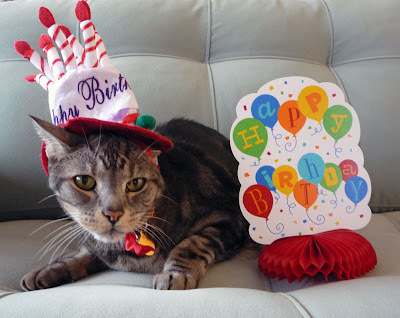 Pimp put on the special birthday cake hat and I even bought him some decorations. That's his table centerpiece he's modeling with up there. Festive! Doesn't that look like a rockin' party? Pimp and Moo really know how to celebrate. It's also the 4th of July! So, we had to celebrate that, too, of course. 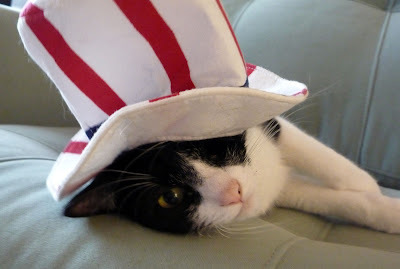 Lucky for Pimp and Moo, we have an Uncle Sam hat they can wear for occasions like this! Does this hat make my ear look big? I have a big hat! Hope everyone has a happy and safe holiday! Here's to lots of purry happenings in the future! 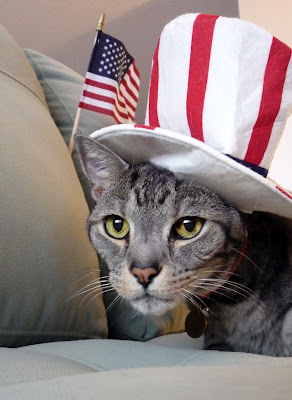 Happy birthday and happy 4th of July! Awesome day. Happy birthday, Pimp! I think the whole country is celebrating your birthday today! Happy birthday Pimp. We almost share the same birthday (mine was yesterday). Enjoy your day! Happy Birthday Pimp and enjoy the 4th of July! 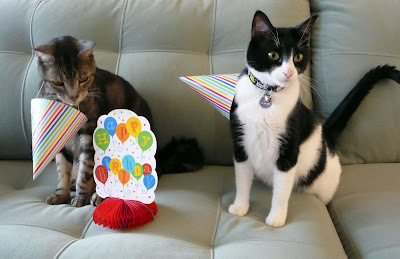 HAPPY BIRTHDAY PIMP, MOO... YOU AND PIMP LOOK SO HANDSOME, HAVE FUN AT THE PARTY...HAPPY 4TH Also!!! HAPPY BIRTHDAY PIMP! AND HAPPY 4TH TO YOU, MOO AND MOM!! Happy Happy Birthday Pimp. We sure hope you have a great day and don't have to wear any more hats. Love the birthday hats, everywhere but on top of your heads. Happy Fourth to you too. Extra treats for everyone. Happy birthday, Pimp! And Happy 4th to all! Woohoo - Congratulations big guy. Wow 12 years old. That is outstranding. Oh dear, does that make you a senior citizen? Maybe you get extra perks for being a senior - like extra kibble or treats. Happy PurrfDay Pimp! You got borned on the best day of the year! Hippo birdie two ewe Pimp! Happy Birthday! You and Moo are so cute in your patriotic hats! Happy Birthday to Pimp. Moo looks like he is having some fun too! Happy Birthday Pimp! Hope you get lots of nice cat nip toys. Happy Birthday to you, Pimp! It looks like you and Moo are having a great day! love love love the photos! HAPPY BIRTHDAY MOO! happy birthday! u are adorable! may u have many more! Happy Birthday Pimp! You don't look a day over mao. Happy Birthday sweeie. You look purrfect!!! hope you had a great bday Pimp! looks like quite a celebration - you and Moo both look great in your hats! Happy birthday, Pimp! Congratulations on your 12th and may you have many more.